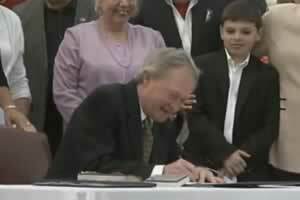 Moments after a gay marriage bill cleared its final legislative hurdle on Thursday, Rhode Island Governor Lincoln Chafee, an independent, signed it into law on the steps of the State House. The measure cleared the Senate last Wednesday with the help of all 5 of its Republican members. It returned to a House committee on Wednesday to reconcile some language differences between a version approved three months earlier in the House. House lawmakers approved the legislation with a 56-15 vote, a better outcome for supporters than the previous 51-19 vote. Hundreds of jubilant supporters gathered outside the State House to witness the signing. Among those seated near the podium were the bill's lead sponsors, Rep. Arthur Handy and Senator Donna Nesselbush, and House Speaker Gordon Fox, of whom the last two are openly gay. “I am proud to say that now at long last, you are free to marry the person you love,” he added. “Together, we shattered the myths. We changed hearts and minds on this issues one at a time,” she told the crowd. The last speaker to address the crowd was Rev. Gene Dyszlewski, chairman of the Rhode Island Religious Coalition for Marriage Equality. “When we allow all loving couples to marry, it strengthens our communities, our families, our congregations,” Dyszlewski said. The legislation takes effect on August 1. CORRECTION: A previous version of this story stated that Rep. Arthur Handy is openly gay. He is not. We apologize for this error.